Comments: Deciduous tree native to the dry highlands of Brazil. 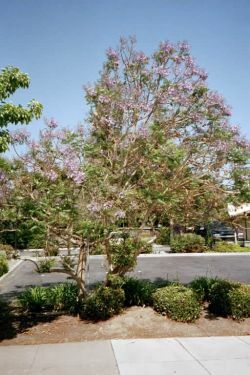 Mature trees can be 40' to 60' tall and broad spreading. 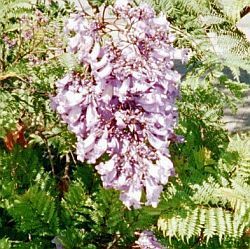 Blue-violet flowers in Summer and bright green double-pinate compound leaves are similar to a mimosa tree. Seed pods are disk shaped to 3" diameter. Young trees are frost sensitive, but mature trees can take temperatures down to -7 deg. F. There are several small Jacaranda trees in McIvor Hardware's parking lot.